Robin Stevens Payes recently returned from Monterey, California, where she presented the livestreamed program, "Da Vinci to Disney: How great thinkers think," with Walt Disney Family Museum educator (and former educator for the Kreeger Museum here in DC) Antonia Dapena-Tretter. While there, she did a book reading and signing for Edge of Yesterday, and her newest book in the multimedia, interactive teen time-travel adventure series, Da Vinci's Way, for educators and parents involved in STEM and STEAM learning. What if your smart device and a big idea could bring you to the Edge of Yesterday—to interview a forgotten French female physicist, and visionary on women's roles in the Enlightenment? "Robin Stevens Payes has an enthralling EDGE OF YESTERDAY book series that is designed to open the minds of middle-grade readers to the adventure of learning about STEM/STEAM (science, technology, engineering, art and math) through storytelling." Podcaster and provocateur Mark Combs asks the hard questions about writing, imagination, Leonardo da Vinci, and where ideas come from in his Public Display of Imagination podcast. Book blogger and time-travel author Deborah Kalb interviews EOY's Robin Stevens Payes about her newest book, Da Vinci's Way. Talking girls, story, STEM and STEAM on the WCBS radio Author Talks podcast. Edge of Yesterday was featured on the syndicated Daytime TV show. BookTrib lauds the new Da Vinci's Way for "Futuristic Stances on Work and Learning" A teen time travel series "Edge of Yesterday" help guide young people toward finding their own passions and following their dreams. The newest book in the series. Da Vinci's Way, takes stalwart time traveler Charley Morton to explore her favorite subjects, science and math with one of the masters, Leonardo da Vinci. Edge of Yesterday was featured on Fox45 Baltimore. The SheSoft 2017-18 Championship and Conference drew more than 130 individuals, including nearly 50 young technology enthusiasts, on June 2 for a day of competition and learning at George Mason University. 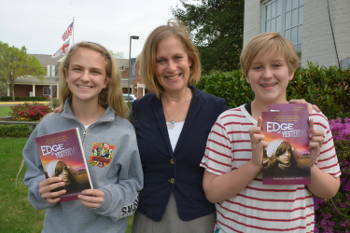 The girls had the opportunity to participate in live interviews and interactions with Robin Stevens Payes and were rewarded with an Edge of Yesterday book autographed by the author. BioBuzz sat down with Robin to learn about her journey, the projects she's working on, and the vision that she has for STEAM education for the next generation of young scientists. 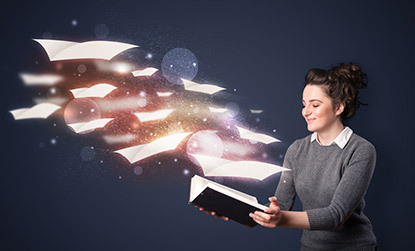 Book blogger Deborah Kalb gets up-close-and-personal with Robin Payes about writing, time travel, STEM and promoting curiosity and creativity in teens. Robin Stevens Payes wants to use fictional time travel to inspire real-life change for kids getting into STEM. And she's doing it with the help of a Finnish learning model, a French polymath and a school fit for the President's kid. In a debut novel, Edge of Yesterday, author Robin Stevens Payes, brings Leonardo da Vinci and his visionary powers to life through the eyes of a modern-day teen. When 13-year-old Charley Morton decides to build Leonardo da Vinci's plans for a time machine for the middle school science fair, she has two thoughts in mind: to win first prize and to travel back in time to meet her Renaissance idol, Leonardo. 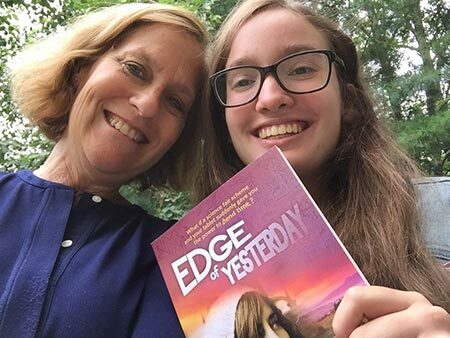 Claire van Stolk '18 has spent her summer exploring how all her favorite subjects &emdash; history, language, math, and science—intersect as an intern for Robin Stevens Payes, author of the new young adult novel, Edge of Yesterday. Edge-of-Yesterday-author Robin Payes published a new article on the National Girls Collaborative Project website. 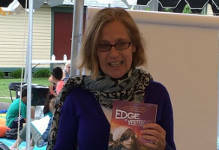 Edge-author Robin Payes co-lead the Maryland Writer Association Teen Writing Workshop at the 2017 Gaithersburg Book Festival. Edge of Yesterday made the news again as it was featured in Innovation & Tech Today . The article explains how we use Leonardo da Vinci's teachings as a core for our updated approach to STEM and STEAM. This past week, Edge of Yesterday was featured in The Washington Post as a new approach for STEM and interdisciplinary learning methods. What happens when three middle school readers meet Charley? Rave reviews! 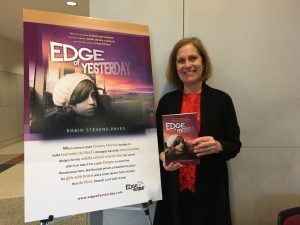 At an author's lunch, we discussed how Edge of Yesterday came to be, what it takes to write a novel, and encouragement for aspiring fiction writers. Thanks to our reviewers from St. Andrews Episcopal School for your insights! EOY Media would like to welcome two new partners to help us all learn and grow in an amazing environment! ÊTRE Être Girls, a middle school girl empowerment organization, and EOY Media are joining forces to promote reading and engagement with positive stories. Être Girls is featuring Edge of Yesterday as a book selection to encourage middle school girls to #BeWellRead. We're aligned with #HackHarassment, a project of Intel, the Born This Way Foundation and Vox Media to keep Edge of Yesterday and EOY Media awesome, safe and respectful. Now it’s your turn: Let’s keep the internet awesome. Sign the #HackHarassment Pledge.